A Sulzer service centre in Purwakarta, Indonesia. Photo: Sulzer. Sulzer has named Al Majal Technical Services (AMTS) as its authorized repair partner in Iraq. The AMTS workshop, located in North Rumaila, is a 3000 m2 state-of-the-art facility, equipped with a comprehensive set of machine tools and balancing equipment required to maintain and repair rotating machinery of all manufacturers. Founded in 2015, AMTS is certified to ISO-9001:2015, ISO 14001:2004, OHSAS 18001:2007, API 6A and API 16A. 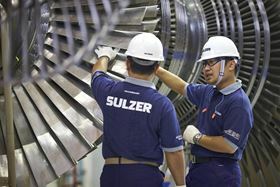 Sulzer says its own engineering and project management expertise together with the local competencies of AMTS strengthen each other’s capability to execute the overhaul, site service, repair and maintenance of pumps, turbines and compression equipment as well as their associated ancillaries. The two companies are currently jointly engaged in executing service projects in South Iraq.